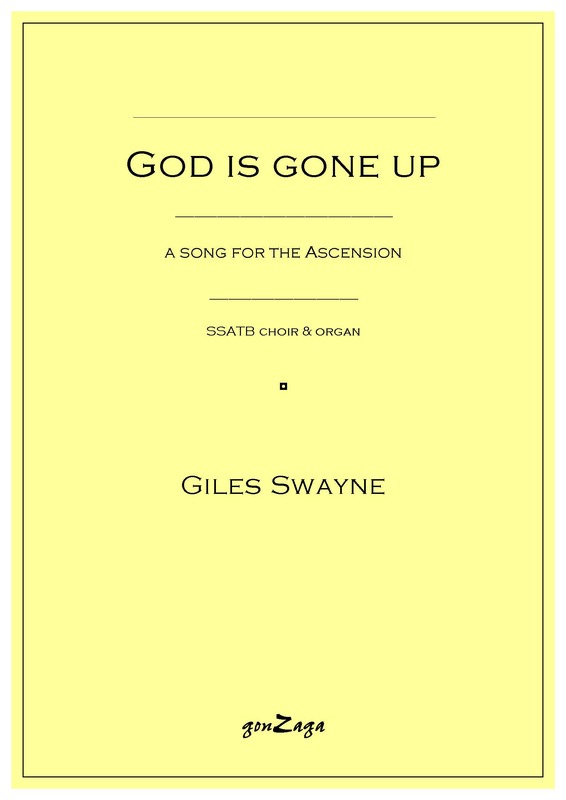 God is gone up – a song for the Ascension – was commissioned by the choir of Clare College, Cambridge and had its first concert performance at the Spitalfields Festival, London on June 20th 2014. 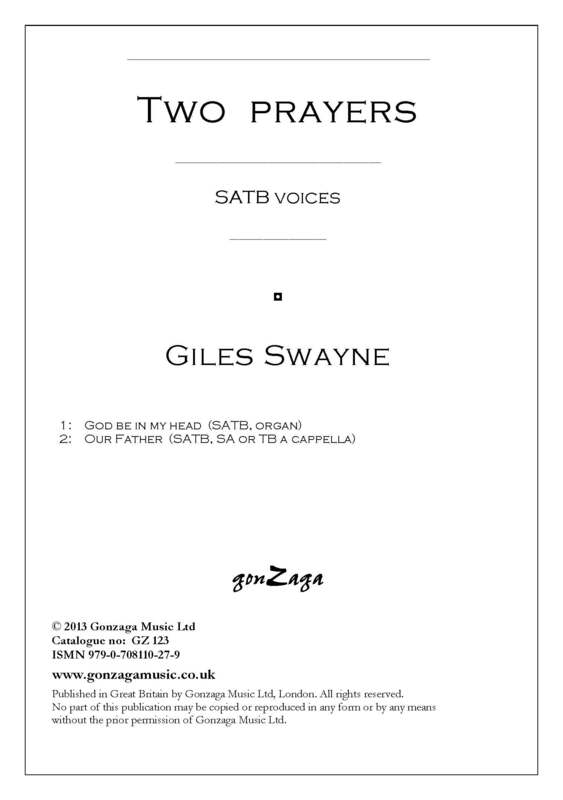 It is dedicated to the memory of John Tavener. In this vivid setting of the Ascension scene, Jesus’ apostles (choir) have gloomily watched him vanish into the sky, accompanied by a fanfare which gradually fades to silence. The distant voices of angels (three solo sopranos placed high on a gallery and far from the choir) are heard from heaven, singing Jesus’ name in Greek. Two angelic figures (alto, tenor and bass soli, singing as one) appear beside them and ask (in Latin) why they are staring up at the sky: “Viri Galilaei, quid admiramini?”. The apostles express their sorrow at the departure of Jesus. The angelic visitors, using the Greek words of a hymn quoted by St Paul, explain Jesus’ incarnation, importance to mankind, and ascension in glory. The apostles repeat (in English) each line after the angels, and gradually regain their spirits. The tempo increases until it is twice the speed of the opening – at which point the fanfare returns, but this time as the counterpoint to a triumphant “Allêlouïa” sung by all voices. Over the top of this, the three heavenly sopranos sing the Greek words of the ancient acrostic used as a symbol by early Christians: “Iêsous Christos Theou Huios Sôtêr” (Jesus saviour, anointed son of God), the initial letters of which spell the Greek word for fish. 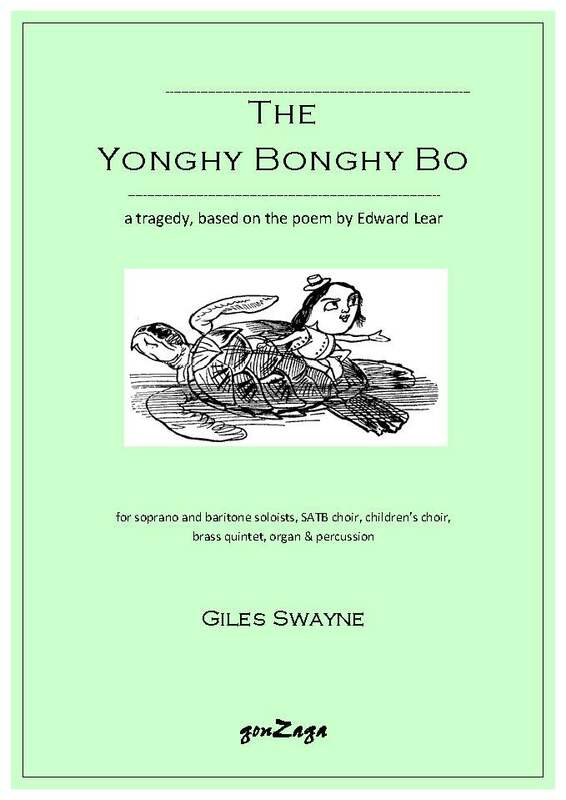 A poignant, almost operatic setting of the great poem by Edward Lear, The Yonghy Bonghy Bo was premiered at St David’s Cathedral on May 27th 2014. Sky Ingram sang Lady Jingly, Giles Underwood The Yonghy Bonghy Bo. The choir was Cantemus, the brass quintet was Onyx Brass, the organist Daniel Cook, and the children were choristers from St David’s Cathedral. The performance was conducted by Huw Williams. The Coromandel coast is in southern India, and the names Jingly and Yonghy-Bonghy-Bò have a distinctly Indian sound. Handel Jones has had his wicked way with a local girl, promising her marriage and respectability before leaving her in the lurch and fobbing her off with gifts of poultry. The Yonghy-Bonghy-Bò has adored Lady Jingly since their childhood. He is poor, and can offer none of the material security or social status with which Jones has inveigled her, but his love is as deep as the Indian Ocean which pounds the nearby coast; and he points out that “Fish is plentiful and cheap”. Lady Jingly returns his love, but is bound by propriety to wait for Mr. Jones. In deepest misery, she rejects him with the killer line “Will you please to go away?”. The Yonghy-Bonghy-Bò flees in despair, climbs on the back of a friendly turtle, and is swept away into the depths of the ocean – the implication being that he is carried to his death. Lady Jingly remains alone with her Dorking fowls, forever mourning her adored Yonghy-Bonghy-Bò, and waiting in vain for the dastardly Mr. Jones. The Yonghy-Bonghy-Bò was commissioned by John Armitage Memorial (JAM) and the St. Davids Cathedral Festival, with financial support from PRS for Music Foundation and the Britten-Pears Foundation. A miniature trombone concerto written in 2013 and commissioned by Clare College, Cambridge. It consists of a Prologue, ten mini-movements (which mostly run together), a trombone cadenza and a coda. In each mini-movement, one of the band acts as the trombone’s duet-partner; hence the title. The subtitles are: Secret Fugue (glittery percussion, trombone clowning); Sarabande (c’bass & trombone in ponderous coupling); Courante (clarinet flighty, trombone teasing); Serenade (trombone amorous, harp glamorous); Rough stuff (punch-up for trombone and trumpet); Remember me? – tragi-comic Dido’s lament (suicidal cello with impatient, mocking trombone); Two-part invention (violin and trombone gymnastics); Sentimental interlude (maidenly viola disgusted by trombone crudity); Flight (fluttery courting pigeons); Canzona (crooning song for trombone & sax). In the Prologue the trombone introduces each of the other instruments; then he moves around the platform, rousing his duet-partners to action by attacking, seducing or teasing them. He returns to centre stage for his closing cadenza and a plink-plonk cadence. 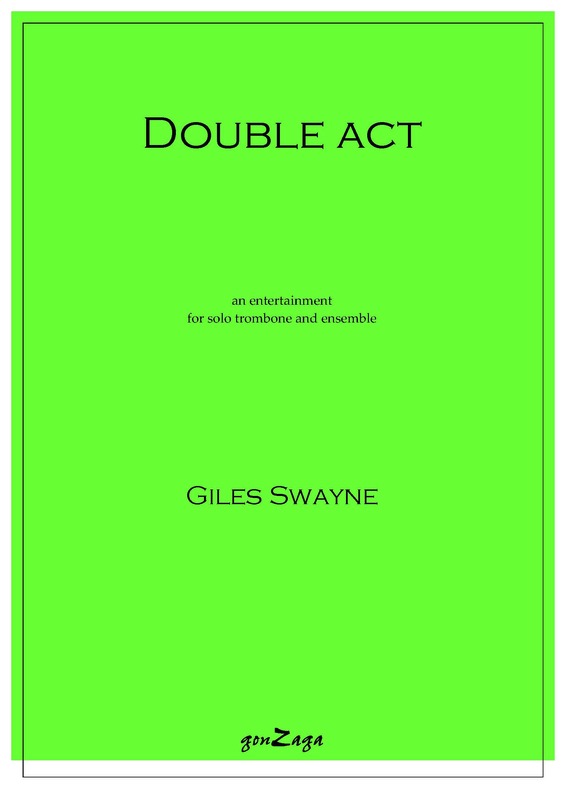 Double act was premiered at West Road Concert Hall, Cambridge on November 21st 2013. The solo trombonist was Michael Buchanan, and the performance was conducted by Patrick Milne. This performance can be heard and seen on YouTube. On April 19th 2012, when Giles Swayne was Composer-in-residence at Clare College, Cambridge, Rebecca Chamberlin, a third-year undergraduate of the college, was killed in a car crash on her way to Oxford with the other members of the College rowing team. 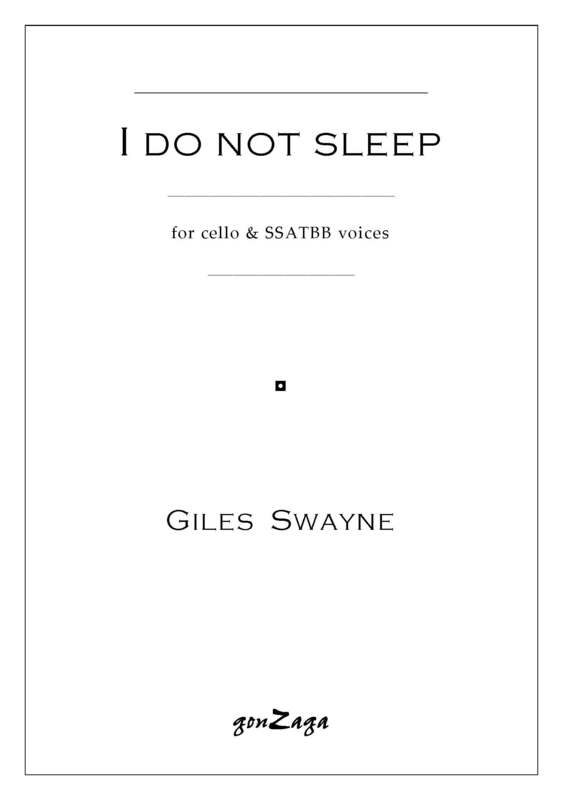 That evening, Swayne wrote this short setting of the poem by Mary Elizabeth Frye – the simplicity of which is set off and enhanced by the plangent lines of the solo cello.